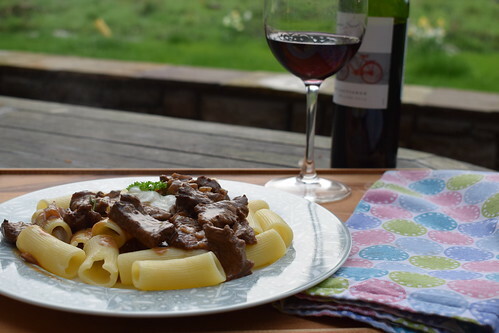 The first recorded Beef Stroganoff recipe originated in 1871, in Russia, in a cookbook entitled “A Gift to Young Housewives“. It has evolved over the years and my recipe uses finely sliced beef, but the original would have used cubes instead. Count Pavel Stroganoff’ was unlikely to have invented it, merely used it when entertaining, and the name stuck. Very fashionable in the 80’s, I like it as an alternate to stir fry, when a slightly warmer and creamier sauce is looked for. Slice the steak as thinly as you can, then season. In a large, frying pan, melt half the butter with half the oil. Increase the heat, then quickly sear the meat in batches until browned, a lovely caramel colour on both sides. Remove the meat from the pan and set aside. Repeat with the mushrooms, then set aside with the beef. Add the remaining butter and oil to the pan and soften the finely chopped onion for a few mins. Stir in the flour for about 1 minute, then gradually stir in the stock and wine. Simmer for about 7 minutes until thickened, then stir in the mustard, purée, crème fraîche and seasoning. Bubble again for 5 minute more, then return the beef and mushrooms to the pan. This sauce has a gorgeously rich deep velvety flavour, that begs to be mopped up with some bread at the end, so don’t be shy in serving some. Traditionally I serve this with some creamy mash, rice or some pasta, but you decide whatever you fancy. 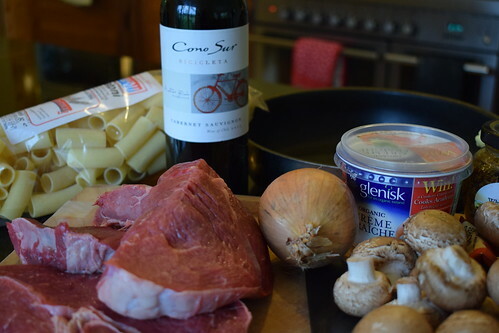 One Response to "Beef Stroganoff- my super quick recipe"
Looks awesome Jeni; no reason an athlete cannot cook this up and serve on some cauliflower rice or edamame spaghetti to add room for the super lush stronganoff and healthy fats.